Under the Cupola: Spin all the things! I was doing some cleaning. For some reason I'm not able to recall, I started digging in my stash boxes and discovered that my roving is happily inhabited by dermatid beetles. The beetles eat flowers or some such but their larvae are rather ugly fuzzy things that eat wool. They prefer cashmere, though, or cat hair. If you are interested in the little buggers, google them yourself. I know them and due to insectophobic people, or just Oooooh-creepy! people, I'm not even linking. I inspected the rovings and my precious Scottish cashmere seems to be untouched but I decided that the safest way of dealing with the problem is to spin more. After all, disturbing the buggers disturbs them, complicates their sexual lives and maybe light and air kills them, who am I to know. I however decided that it would be a damn good idea to go through the fibres via spinning them. I made daily allotments and I'm keeping with the plans quite well. This is natural brown Shetland roving. The proper name of this fibre colour is moorit. 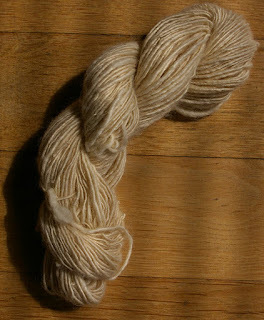 So far, I have some 100m of two ply, which may have used up around a half of the total of 120g of fibre. I have some natural black roving, which is in fact deep chocolate brown, true grey, sort of grey and white, which just calls for some knitting project in all natural colours. This yarn is probably Blue-faced Leicester. I got it from a Norwegian Raveller whose name I forgot (sorry), redyed it towards green and continued in my usual manner - singles with Z-twist, loose double. It drafts somewhat less eagerly so in fact, it's PITA to spin and my fingers hurt. But the result is pretty and fluffy and anyway. Bleached yak. Spins like butter. The fibres have short staple length so it needs to be spun carefully. I intend to keep it a single. To those who don't understand the fibery language: Look what pretty things I made. Yes I'm still grumpy and down. I even have half a bar of chocolate on my table and it tastes icky. Means this is a damn bad day. The cat however didn't end it the way it started and refrained from further puking in my bed. Either she did something else or she likes clindamycin because she's licking my shoulder.